When I started to think about what career I wanted, I had a lot of doubts because I was not sure on what I really liked. Upon finishing high school, I told myself, ‘what now Marta?’ What followed was a period of time where I combined studying alongside a selection of jobs that did not inspire me or utilise my talents (flight attendant, environmental chemistry work and more). Chance and destiny have a funny was of aligning when you are lacking direction. I always enjoyed experimenting with computers and had done some small jobs for friends but they were few and far between. That’s when I was given the opportunity to do a design job that was on a larger scale. The opportunity to make money from a trade so fulfilling was appealing to say the least, so I started to form on my own and the work came to fruition. I developed an interest in everything related to design, to which came a point that I felt it necessary to train in a more professional way. After returning from a position in an advertising agency in Brussels, Belgium, I decided to form my own brand and employment. It is at this point that I am today. I’m a proud and talented freelance designer. I trained at the arts school in Salamanca, but my training is not based solely on my studies. Since this world encompasses an immensity of possibilities still to be exploited, I am of the opinion that we must all continuously learn to fulfil our self actualising creative needs (I may even have a problem with the number of courses I do!). Fundamentally, discovering and exploring are what drive me, with the end goal being to put this into practice. I enjoy my free time with my family and friends. 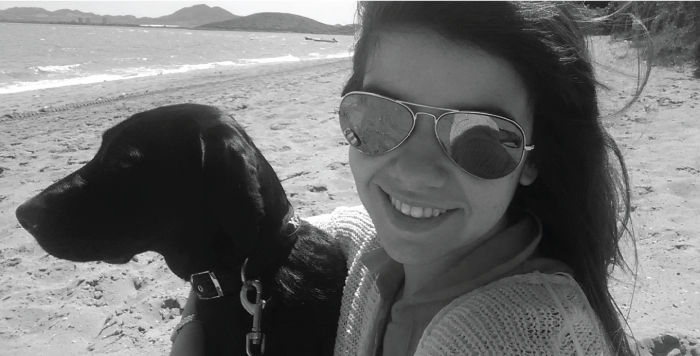 I love nature and whenever I can I make small trips with my partner and my dog ​​Coco. They are my own family and I treasure every moment at their side, which is why I now live in Aranda de Duero, a town of Burgos surrounded by nature and lovely people. My main professional goal is to achieve true work-life balance – to dedicate myself to my passion without compromising the things that make me happy. It is for this reason that I launched into the freelance world because fulfilment and professional excellence begin from the fundamentals. And first of all very good vibes! Additionally, thanks to my experience working in Morris & Chapman in Brussels, I am able to defend myself in various languages including English and French. With MDsgn (Marta Design) I want to show my potential through a serious brand with an attractive design that represents who I am and how I want others to see me. For the brand icon, the use of a geometric shape provides modernity based on triangles that together form the letter M. Triangles represent balance and the number 3 (my favourite number), a symbol of artistic expression and human interaction, as well as the optimistic and happy spirit. For the colour part, the use of a palette of pink tones embodies my passionate side as I have great ability to fight for my dreams. Finally, the initials MD use a more compact style that demands the visual attention while the rest of the letters use more subtle script typography to complete the design with elegance. The colour purple was chosen because I consider myself a creative spiritual person as well as highlighting the rose icon and bringing a visual balance to the weight of the image. I develop creative and innovative projects for various publics thanks to strategic planning that I implement from the beginning of every project. Each brand has a goal and must be treated individually to achieve the best results. In order to enhance every quality of the brand, I get personally involved with the company by researching its public and its skills. I give each client the full attention, time and dedication necessary for the project to be successful. I know how important planning is from the search for objectives down to the initial sketching which allows solid, durable and functional design projects.